I chose these cases to launch 2015 because everyone (even me) indulged in the holiday food treats. Many people may have felt worse after eating the refined sugars, GMO (genetically modified) infused foods, and highly processed foods. If you didn’t feel worse after eating non sustainable foods, you need this information THE MOST. This blog will show you what your blood may have looked like after eating those foods. Live blood analysis is a technique that allows me to look at fresh blood and “see” into the working body. We can evaluate how well digestion is occurring (or not) based on the appearance of the red blood cells along with other clues such as uric acid crystals, yeast and parasites. Red blood cells are supposed to be round, separated and floating in a healthy plasma medium. Their job is to carry oxygen and nutrients (sugars) to the tissues (organs) and remove cellular waste products made by the tissues (organs) during normal metabolism. The red blood cells accomplish this exchange through their cell membrane. You can imagine that if much of the surface area of the cell is covered or crumpled, it can not do its job effectively. Consequently the body suffers dis-ease. The video case below was a mid aged dog who was eating a kibble diet all her life. She was grossly overweight and was suffering from chronic urinary tract infections and skin disease. We know that if an individuals immune system is not working, no matter how many drugs you use, it won’t help. The immune system is supported by digestion. 80% of the immune system is in the mucosal lining of the large intestine! If the gut isn’t good, the immune system isn’t good either! My focus for this dog became diet, digestion and gut health. 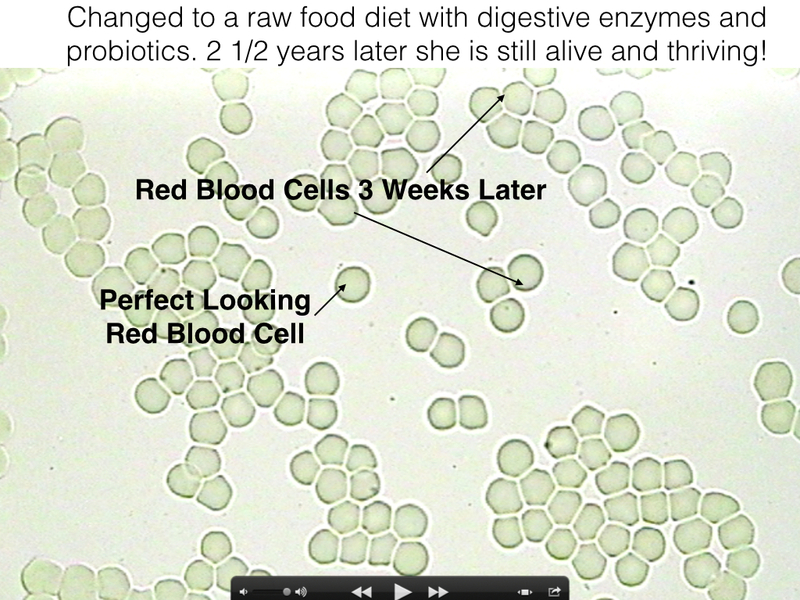 She was started on a better diet and was given whole food enzymes and probiotics. The live blood study speaks for itself. Please share the link and subscribe to our channel! The information you share may save a life!